Today I am sharing a very requested blog post with you all – my latest skincare routine! I get messages daily regarding what I use for my skin, what I love, and what I products I incorporate daily. Over a month ago I was introduced to a new skincare line – JAFRA! As a blogger I receive many skincare products to try. When something is working I am hesitate to switch things up. However, JAFRA Revitalize really stood out to me. Whenever I start a new line of products I give my skin at least 4 weeks to adjust. Im currently a month into my new skincare and I am absolutely loving it! My skin type is dry with the occasional breakouts. However, I have noticed a lot more discoloration and uneven skin tone these past few years. Once I hit 30 it was apparent that my skin was in need of some extra love. For the past 3 years I have really stepped up my skincare game by investing in my skin. I follow a routine, as well as research the products I put on it. JAFRA has been such an amazing addition and I am so happy with how my skin has looked and felt. JAFRA uses high quality ingredients that enhance and improve your skin. I am currently using the JAFRA Royal Revitalize line and I am loving how my skin has been looking & feeling. For the past month I have gone without a single breakout –Say What?? The line also lets you customize to your exact needs which makes it works for all skin types. Purity & Hydrate with the JAFRA Royal Revitalize gentle cleansing milk. This cleanser gently removes my makeup, and daily buildup while keeping my skin conditioned. I used to use an abrasive cleaner and learned it was actually aggravating my skin. Second, I use the Revitalize serums. They have three options; Protect & Refine, Lighten & Brighten, and Lock in Hydration. Since I struggle with dry skin I use the hydrating serum which conditions and softens my skin. The serum is such an amazing product and I think it has been one of the products that have really helped to transform my skin. Time to moisturize. This line came with the Longevity balm that is a lightweight formula that I use during the day. For my nighttime routine I use the Longevity creme which is a thick hydrating moisturizer. The lightweight formula works great under my makeup while the thick one keeps my skin conditioned all night long! Next, I protect my skin for the sun and signs of aging with the Solar Protection SPF 50. I wish I could say I was always good about wearing sunscreen, but I wasn’t. These past few years I have started wearing it daily and I absolutely love this one. Each night I apply the Longevity eye creme to help fight aging. Im battling crow’s feet and I have seen some improvement in my lines which makes me very happy! This Volcanic Micro Polish Mask has been one of my favorite additions to my skincare routine. I incorporate it 2-3 times a week. You can use it as a microdermabrasion treatment or mask. It is a charcoal formula with exfoliation. This helps to remove the dead skin. My face looks dewy and refreshed after and feels amazing!!. I am so happy that JAFRA was introduced to me. I started using this about 30+ days ago and I have seen a huge improvement with my discoloration and it’s seems more hydrated which helps my skin appear younger. 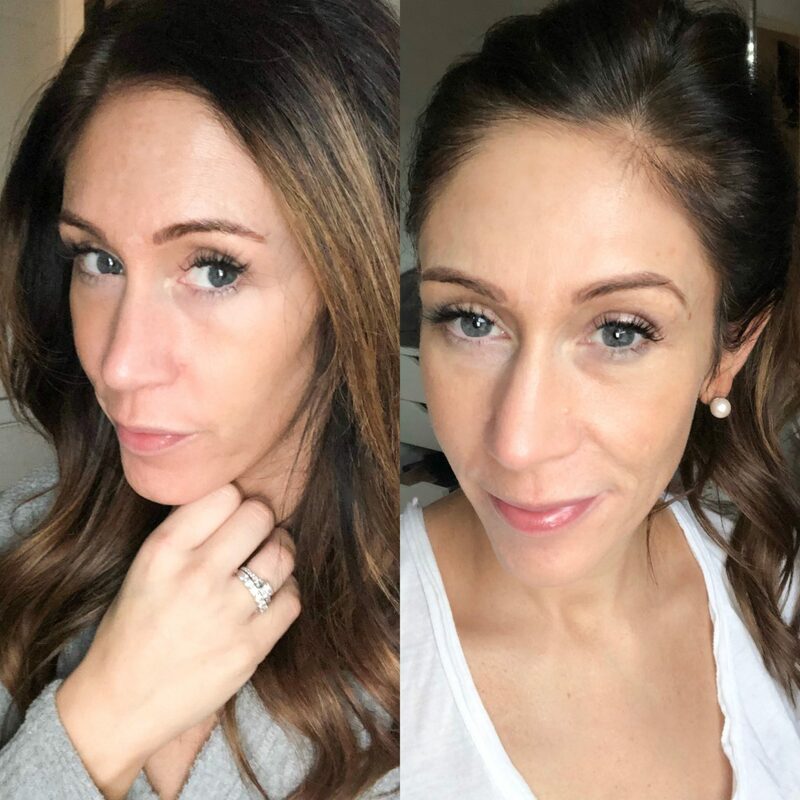 These big improvements in my skin has made me so excited to share my thoughts and results with you all. I highly recommend these products and think they would also make a great gift for a mom, sister or friend! They use amazing ingredients like vitamin A, E & C, alfalfa exact, knot grass, coconut and moringa. I wish I had started taken better care of my skin earlier on in life but this line has certainly helped me to reverse many of my concerns. I hope this was informative and helpful. I receive many questions about my skincare routine. Since I do change things up here and there I have to truly love a certain product or brand to share with you all. This one has been great so far and I plan on continuing using this for months to come. This brand also has many other lines like Royal Boost, Brightening Dynamics and many more! Please let me know if you have any questions. Have an awesome day girls and thank you for reading.